We are willing to bet that you’ve been travelling for work, or maybe on vacation, and you’ve noticed them. Maybe not right away, but after you settled into your hotel room, be it cheap or expensive, you noticed them. They’re - different than the others you know. So smooth. So quiet. So inviting. They’re your hotel room curtains. They overlap! They have sticks on them! And when you sleep it is so blessedly dark, and cool, and quiet. You’ve wondered why your curtains at home aren’t like this. Maybe you’ve tried to reproduce them at home and been frustrated when the big box home décor stores didn’t have the right products (you are not alone). Hotel curtain tracks, drapery hardware, and curtains are in a league of their own, but we have everything you need to bring the experience home. First, the track. (Have you ever seen a hotel room use rods? We didn’t think so.) Most hotels use the 84003, or the 84004 Ball-Bearing Carrier Curtain Tracks. The 84003 tracks can be spliced together for longer applications and require ceiling clips or wall brackets for installation. The 84004 track comes in eight-foot sections and can be installed directly into the ceiling. Both use 84100 ball-bearing carriers. What truly separates hotel curtain tracks from most home installations is the use of the Master Carriers and Wands. These ingenious pieces of drapery hardware allow the curtain panels to overlap when closed, maximizing light blocking and privacy. Plus, use of the wands to close the curtains minimizes hand prints and wear from being pulled from the middle. Last, but not least, the curtains. 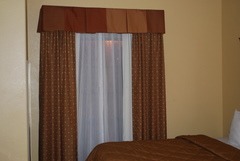 Most hotels hang a sheer curtain and a light-blocking panel by installing two ceiling-mounted tracks in parallel. The sheer can be any style of light fabric you like, but there are no better light blocking panels than our Eclipse fabric light blocking curtains. They are available in multiple lengths and over twenty colors, are sound absorbent, energy conserving, and block 98% of light. Also, they are machine washable and flame retardant – what’s not to like? Want to recreate the hotel experience in your own home? Follow us on Pinterest to get more ideas.